May 24, 2017 – Osborne, Kansas – Osborne Industries, Inc., custom molder of thermoset plastics via Resin Transfer Molding (RTM) utilizes a variety of fiberglass types in their Resin Transfer Molded (RTM) thermoset fiberglass-reinforced plastic (FRP) parts for leading equipment manufacturers. Osborne’s team of engineers and molding specialists will work to identify the best glass-reinforcement for your application. Osborne can give your part the reinforcement needed to meet harsh environments in the field. With the recent installation of an Eastman® Raptor 75x™ automated, multi-ply cutting system, Osborne now has the capability to precisely cut large stacks of flat fiberglass to the close tolerances required by strict customer specifications. The cutting system can accept flat glass up to 74 inches (2.79 m) in width and is continuously fed from a roll carousel onto the conveyor table for optimal efficiency. Automatically cuts complex patterns in stacked glass on a modular, bristle-block conveyor bed. Continuously feeds and cuts up to 7 plies of fiberglass at a time. Accepts plies composed of any combination of glass types in order to produce the best reinforcement layup right off of the machine. Utilizes rigid, serrated Tungsten cutting blades for reduced deflection and optimal blade life. No matter the reinforcing material required for your next project, look no further than Osborne’s FRP composite manufacturing. With Osborne on your team, you gain technical and engineering expertise along with the skills of dedicated craftsmen with over 35 years of practical, day-to-day production experience. For more information on Osborne and their products and services, call 1-800-255-0316 (1-785-346-2192), e-mail plastics@osborneindustries.com, or visit www.osborneindustries.com. 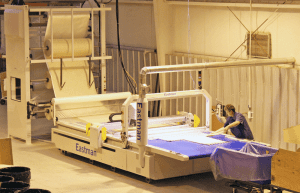 The Eastman® Raptor 75x™ automated, multi-ply cutting system is used to cut large stacks of flat fiberglass for Osborne’s custom RTM composites manufacturing.